FILE - Protesters march toward the U.S. Embassy during a rally supporting the U.S. policy to put steady pressure on North Korea, in Seoul, South Korea, Nov. 3, 2018. With negotiations at an impasse, Washington has imposed additional sanctions on those assisting Pyongyang — the first such action since February's failed summit in Hanoi between President Donald Trump and North Korean leader Kim Jong Un. 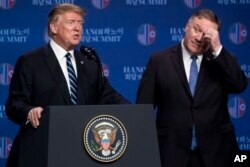 FILE - In this Feb. 28, 2019, photo, U.S. President Donald Trump, accompanied by Secretary of State Mike Pompeo, speaks at a news conference in Hanoi, following talks with North Korean leader Kim Jong Un. Trump said he walked away from his second summit with North Korean leader Kim Jong Un because Kim demanded the U.S. lift all of its sanctions. "Insisting on unilateral North Korean disarmament upfront is pushing on the wrong door. We should be pushing to first slow the program, then cap it, and ultimately keep rollback and disarmament the long-term goal," said Vipin Narang, associate professor of political science at the Massachusetts Institute of Technology. "But every month that passes without a grand deal is one in which North Korea's nuclear program continues to grow larger — increasing the risk of its own use and proliferation to other countries — and the chances of a deal grow smaller." 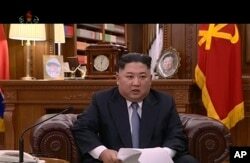 FILE - In this undated image from video distributed Jan. 1, 2019, by North Korean broadcaster KRT, leader Kim Jong Un delivers a speech in North Korea. 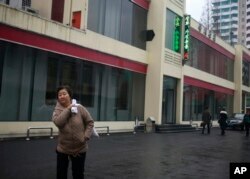 FILE - In this Dec. 21, 2018, photo, a North Korean woman walks outside Bugsae Shop, also known as the "Singapore Shop," in Pyongyang. Business is booming at such shops, which sell everything from Ukrainian vodka to brand-name knock-offs from China. The stores stock many of the very things U.N. sanctions banning trade in luxury goods are intended to block. The current primary point of pressure on Pyongyang by the international community is on entities, including their ships, involved with illicitly exporting North Korean goods, such as coal, and taking products — especially petroleum — into the impoverished country in violation of U.N. sanctions. A coalition of countries — using their vessels, aircraft and classified intelligence means — are daily watching the movement of ships involved in the illegal trade. 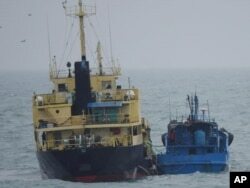 FILE - This photo released by Japan's Ministry of Defense shows what it says is the North Korean-flagged tanker Yu Jong 2, left, and the Min Ning De You 078 lying alongside in the East China Sea, Feb. 16, 2018. Trump and Kim have held two summits — the first in Singapore last June and the second in Hanoi this February. Trump has not ruled out a third such meeting.